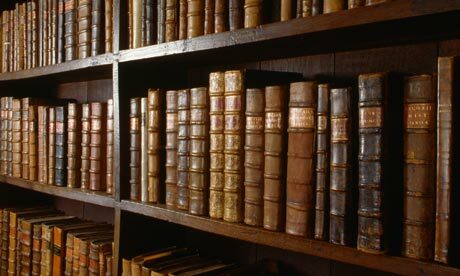 Works Proposed: Below are the works that are currently being translated. Translator(s): Francisco J. Romero Carrasquillo, Ph.D.
Abstract: This translation fills an enormous gap: it finally puts into print and at the reach of serious beginners in Thomistic thought a work that follows such a method faithfully, thus providing them with a solid means to learn the all-but-forgotten art of scholastic disputation. Hugon offers formal arguments with clearly identifiable (major and minor) premises and conclusion; formal objections with clearly identifiable distinctions, etc. Even though with respect to depth and sophistication the work's individual parts may be surpassed by other individual Thomistic authors (e.g., Garrigou-Lagrange, Ramirez, etc. 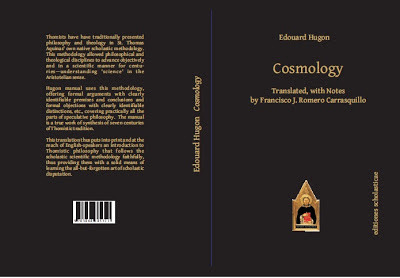 ), Hugon's manual has the advantage of offering the reader a solid, comprehensive, and faithfully-Thomistic treatment of practically all the parts of speculative philosophy, using the Scholastic method. The proposed translation will be approximately 2,100 pages long, and will be published in eight volumes. At $8 USD per page, the project will cost approximately $16,800. 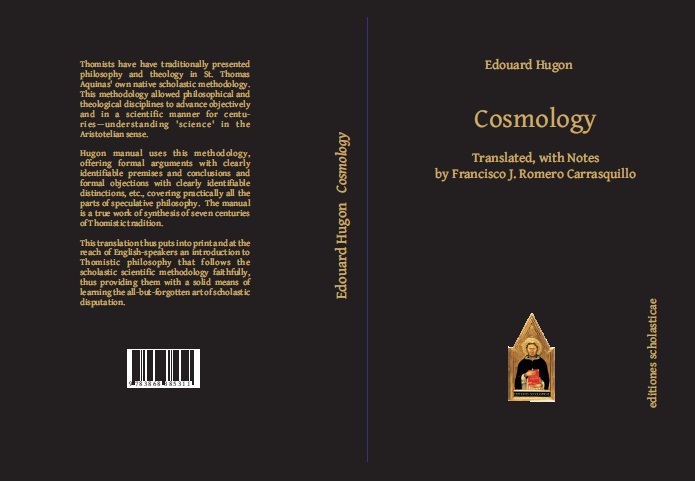 So far, thanks to one generous donor, nearly half of the project has already been funded: the translation of the Cosmology volume (Ia-IIae) is complete and has been accepted by Editiones Scholasticae for publication. Ontology I is close to being completed. Major Logic and Appendix (24 Thomistic Theses) are next in line. At the time of writing, we still need $8,800 to fund the project completely (see fundraising progress below). Ia, vol. 1: Minor Logic, 213 pp (ca. $1,700). Ia, vol. 2: Major Logic, 257 pp (ca. $2,100) - Fully funded, in progress. Ia-IIae: Cosmology, 326 pp (ca. $2,600) - Fully funded, in print. IIa-IIae: Biology and Psychology, 342 pp (ca. $2,700). IIIa, vol. 1: Metaphysical Psychology, 244 pp (ca. $2,000). IIIa, vol. 2: Ontology I, 213 pp. (ca. $1,700) - Fully funded, final revisions in progress. IIIa, vol. 3: Ontology II, 398 pp. (ca. $3,200). Appendix: The Twenty-Four Thomistic Theses, 100 pp (ca. $800) - Fully funded, in progress. Abstract: Since Vatican II the Church has been suffering from a great confusion. The confusion is partly due to a failure to understand the nature and methodology of Sacred Theology. The beloved Thomist Garrigou-Lagrange was well aware of the problem as it affected theologians in his age, and wrote many pages on the matter, although he never produced a single, complete work on it. This translation gathers in a single volume different chapters from several of his works, as they relate to the issue of the nature and method of theology. It aims to serve as a faithfully Thomistic introduction to Sacred Theology for seminarians and other students of theology. Some of the texts are here available in English translation for the first time in history, and those which have been previously translated are here translated afresh, in a more faithful style. The translator aims to render the texts literally into English, in all their scholastic rigor, without smoothing out scholastic idioms or technical expressions (which is what the translators of Garrigou's works in the 1940s-60s did, unfortunately). The volume will be approximately 250 pp long (including the translator's introduction). At $8 USD per page, we are aiming at raising $2,000 for the translation. The proposed publisher is Sapientia Press. De revelatione per Ecclesiam catholicam proposita. De Deo Uno: Commentarium in primam partem S. Thomae. "La Nouvelle théologie, ou va-t-elle?" I just recommended "De methodo Sancti Thomæ" to someone yesterday who was arguing that Aristotelian methodology shackles St. Thomas's theology and that theology must freed from such "fetters" by adopting methodologies more consonant with modernity (and thus with its copious false philosophies…), so it's good to see someone working on translating "De methodo".